With a wide variety of gorgeous new luxury vinyl flooring in Mason City, IA, Flooring America Mason City is the name to call when you’re ready for a new look. Nothing beats the feeling of brand new, luxurious flooring under your feet, especially when you’ve found the perfect style for your home. With our selection, you are sure to find exactly what you’re looking for. Our showroom has an expansive selection of luxury vinyl, making us your source for all your flooring needs. Regardless of what you’re looking for, we are here to help you find it. 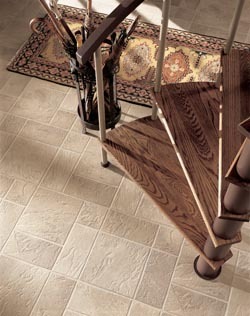 Luxury vinyl tile isn’t popular purely for its durability and price-point. Homeowners flock to this fantastic flooring due to its ability to take on the look of virtually any other flooring type on the market. Whether you want the elegant look of hardwood or the classic beauty of porcelain tile, LVT can be made to look exactly like it. It can mimic other materials right down to the grain on wood or the slight imperfections of stone. Stop by our showroom today to see for yourself just how accurate modern embossing techniques can be. Rooms such as the kitchen and bathroom benefit from a resilient flooring that can hold up to spills and stains. In the past, this meant you were limited to a few specific styles of flooring that might not have matched the aesthetic of your home. Now, however, thanks to LVT, you can get any look you want in your kitchen or bathrooms without having to worry about water damage and stains. Because luxury vinyl can mimic any type of flooring on the market, your options are now endless when designing these rooms. With luxury vinyl plank flooring, you can get authentic-looking wood flooring that holds up to water damage and stains with ease. The best way to ensure your new floors last for years down the road is to seek our assistance for installation. No matter how resilient LVT might be, if it isn’t properly and expertly installed, it simply won’t stand the test of time. For floors that look great and last, turn to us for luxury vinyl tile installation. We are on your side from start to finish, helping you settle on the perfect floors for your needs and then providing the installation services you need to finish the job. Contact us today for more information on our selection of LVT. We are proud to serve Mason City, Clear Lake, Plymouth, Forest City, and Charles City, Iowa, and the surrounding area.